Robots.txt is a text file which is used to instruct the search engines for how to crawl and index the pages on your site. The search engines should be obey the robots.txt. The search engine follow the instruction specified by robots.txt file. 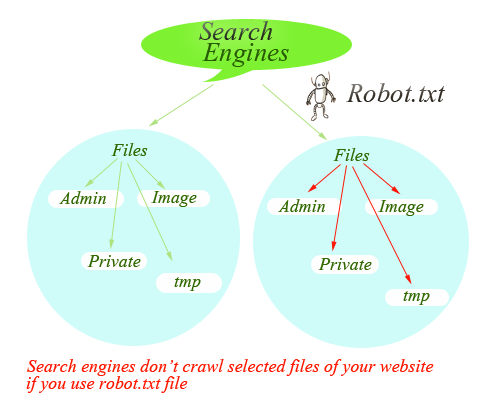 If you want to some of your pages are not crawl by search engine, then you can protect that pages in robots.txt. Then the search engine don't crawl particular pages specified by your robots.txt file. The search engine comes to your robots.txt file before it crawl to your pages. It must be placed in your main directory. Otherwise, it can not able to find robots.txt file in your server. User-agent represents the search engines. Allow means the robots.txt file allow the all search engines to crawl all of your contents. Now, the search engine don't crawl and index your pages. You need a separate disallow for each folder. Now the search engine don't index your images folder. Now, the search engine don't index example.php file in sample folder. It control the individual pages present in search result. It should be present within head tag. The above line instructs the search engine to don't show this page in search result. If you want to restrict particular search engines don't index your pages, then you can use robots.txt to restrict it. Now all the search engines index your pages except google. Googlebot is the search engine of google.